Thanks for hanging in there during these times when I am not able to post much. I have just reached my first “break” for the NTP course through the Nutritional Therapy Association! So far it has been absolutely INCREDIBLE! I have learned so much and met soooo many wonderful, likeminded people! I highly recommend looking into it if you also have a passion for helping yourself and others heal by using the power and intuition of the body and nutrient dense foods. While I think I have finally found a happy balance of doing school work again with my daily life activities, I tend to always tip the scale towards doing “too much” and running myself into the ground (at a steady rate). Just when I think I am pretty efficient at doing A-Z tasks, I realize there is always room for improvement. So, lately I have tried being less lackadaisical when it comes to meal prep (thinking that basic, quick, daily meal prep and shopping was the best route) and really focused on having one or a maximum of two full meal prep days where I make most of my meals (and my clients meals) in one chunk of time. Not only does this get me to plan more creative meals but also gives me a chance to try out new fun recipes myself and takes the extra hour out of other days that I would normally stop what I am doing to shop-cook-etc. For the past MONTH (or so) I have been working on making a paleo hamburger bun that actually resembles a typical hamburger bun. Mostly I’ve gotten a lot of things that taste good but don’t have the right consistency, until now! By total accident, I made this bun with two types of flours, and to my surprise they both came out wonderfully. The cassava flour version of this bun is slightly less-moist and has an awesome macro-ratio for those that are following specific macro-oriented eating plans, while the cashew flour version is a bit more spongey and higher in fat (which is certainly not a bad thing, you need those good fats!). Try them out and let me know which version is your favorite! -Preheat oven to 400 degrees and line a baking sheet with parchment paper. – In a food processor, combine all ingredients and blend until fully combined. -Let the mixture sit for a minute to fully absorb the liquids, then with damp hands, form dough into 4 large balls (the dough will be wet and sticky but will hold a “hamburger bun” shape). -Sprinkle the tops with sesame seeds if you’d like! -Bake for 20-25 minutes until the tops start to turn golden brown. -Let cool for 2-3 minutes and then cut in half and enjoy with your favorite burger! Cassava Buns (1 bun)= 157 Calories, 4.9g Fat, 21g Carbohydrates, 6.8g Protein. -Preheat oven to 350 degrees (F). -Grease a 9×9″ baking sheet with coconut oil. I use a pre-divided pan which takes the hassle of cutting these right out! You can also use a muffin pan instead. -In a large mixing bowl combine bananas, almond butter, honey, eggs, and vanilla. Mash and mix thoroughly until no chunks remain. -Add coconut flour, cinnamon, baking soda, cream of tartar and salt to the banana mixture and stir to combine until smooth. -Add half of the batter to the greased pan (which ever type you decide to use). -Then add then jam (make sure it’s laid out evenly and somewhat flat) over the banana mixture. -Add remaining batter over the top to cover the jam completely. -Bake for 25-30mins or until these start to become golden brown. Let cool for 5 minutes before taking a butter knife (or toothpick) to ensure the edges are not stuck and remove from the pan. Oh yah, and that recipe thing! Lamb isn’t something I’ve always loved but I’ve recently found that when it’s paired with the right ingredients it can be quite tasty and a nice change from my go-to proteins. I found this amazing locally sourced ground lamb and local produce from my favorite spot, River Valley Market. I highly recommend finding a trusted butcher or market that can tell you about your meats: where they come from, how they are treated, meet the farmer if you can! The most nutrient dense meats come from healthy, happy animals and supporting these sustainable and ethical farming practices is beneficial for the consumer, the producer and the environment alike. Happy cooking! -Remove from oven, garnish with pomegranate seeds and serve! My life has been pretty darn hectic lately with a lot of big changes. Normally change has been a cause of anxiety for me (and lets be honest, at times it still gets to me!) but I have been doing the best I can in taking things day by day, moment by moment, and seeing the positive in each situation. For instance: I’ve recently accepted an offer on my house, which is great! It was only on the market for 5 days before I got my first offer and signed the P&S after 9 days! Now, pending inspection, things are moving quite fast and it seems that the closing date is going to be MUCH sooner than I anticipated. After having JUST gotten settled at my new job, new gym, new weightlifting program, and new schedule, of course another curve ball comes my way. BUT- I knew it was coming, eventually. The only thing that has changed is the timing, which, in the grand scheme of thing, isn’t a huge deal, right? Well, I keep telling myself that. I am a firm believer that everything happens for a reason (as corny as that sounds) and therefore stressing over things like this serves no purpose. I’ve always been one to take life by the horns and run with whatever is thrown at me so even though my plans for the future aren’t clear at this point in time, I know that it will all pan out as it should and I will be able to look back and appreciate these moments as they are the ones that spur growth, acceptance, and self discovery. So, how does this rant tie into Stuffed Peppers? 😉 Easy- stuffed bell peppers are a pretty mindless meal that you can throw together quite easily with just about anything you have laying around in your refrigerator. Not only will it look like you created this fancy meal (because you did) but if you know the basics of meat and seasonings that go well together they are bound to taste good as well! This is one of my go-to variations because most of these ingredients are almost always found in my fridge (less things to forget at the grocery store) and you can also add some kind of sauce like coconut aminos, thai ginger, peanut, curry, teriyaki, etc. to easily kick these up another notch. It’s a great recipe for when life is cray and you don’t have any brain power left to get too creative. Try them out and let me know what you think! -Optional: after 20-25 minutes set the oven to broil and broil peppers for 2 minutes to get a little crispiness on the tops! 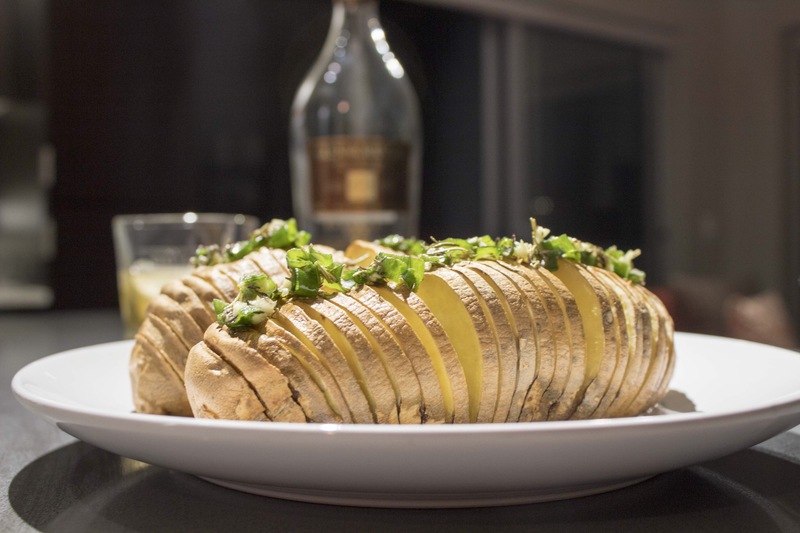 -Garnish with scallions and enjoy! As an athlete it’s important to fuel your body appropriately in order to maximize your performance and recovery. Having an active job along with a dog that requires a long hike or run daily and somewhere between 1-2.5 hours of training each day, the amount of carbohydrates my body needs is sometimes overwhelming. 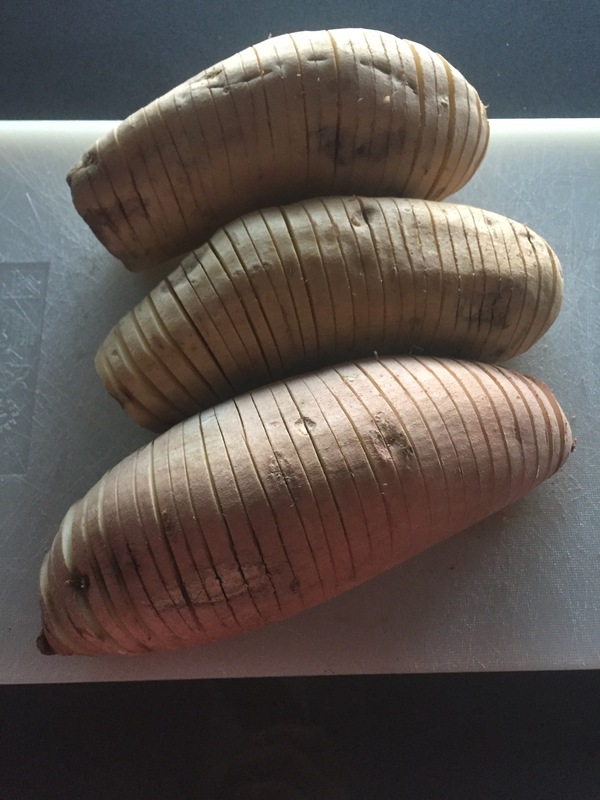 Being on the go so often my sources of carbs are often the quick and easy varieties such as rice and gluten-free oatmeal, but when I have the opportunity to be in the kitchen for a period of time, my all-time favorite source of carbs are white or japanese sweet potatoes (Japanese have red skin and domestic have golden skin). 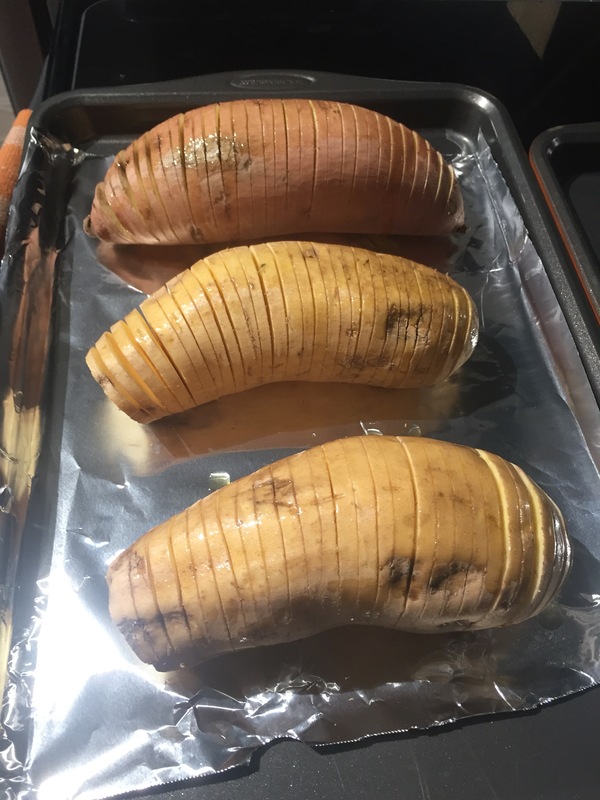 These tend to get crispier than yams and orange sweet potatoes as they are higher in carbohydrates but still contain a vast amount of micro nutrients. This cooking variation is not only delicious but a sure way to raise some eye-brows and get some “fancy” remarks from your friends and family- as a bonus, it’s also super simple! You can also do this with any potato, but if you’ve never tried white sweet potatoes… you definitely should!